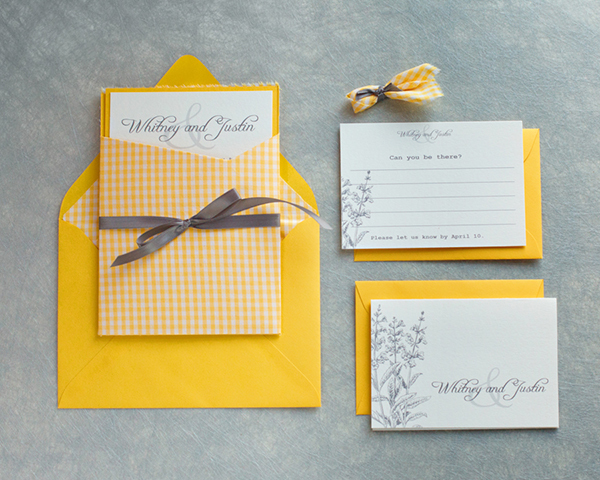 We love featuring wedding invitations & paper products. They add such a great personal touch to your day and really set the tone to your guests for the style & mood of your wedding. The possibilities are absolutely endless. It is so important to work with someone who can help translate your taste & style into your invitations. That’s where a great company like Paper Moss enters the picture. Below are some examples of their incredible work, including stories from founder, Emily, about what led each couple to each design. Enjoy! Melissa & Jason’s invite suite included a belly band which is a great addition to any invite and allows for additional info and an extra pop of color. Belly bands also serve as sort of a ‘modern day’ inner envelope, holding all the cards together inside the main envelope. The couple chose to include a scripture that was meaningful to both of them. The faux postcard stamps on their rsvp included an outline of Louisiana – the home state of the couple. Gail & Ryan’s invite had very organic a garden feel with the flower motifs. To save cost & paper, they opted out of a printed belly band and went with a burlap ribbon & twine, adding the perfect amount of texture! Louisa & Frank’s invite, oh how I loved this suite. This couple were nature lovers. He was an avid fisherman & her a lover of birds – which were both represented in their monogram. Married on a private Oak Farm estate, this became the central part of their monogram. The best part about Jennifer & Scott’s suite are the little icons for each activity. What a great way to personalize an invite and pay a tribute to the venue location. We wanted their invite to be more of an experience so we tied the twine remnant of a present with a tag for each guest. We hope this has given you a little inspiration for your upcoming wedding! 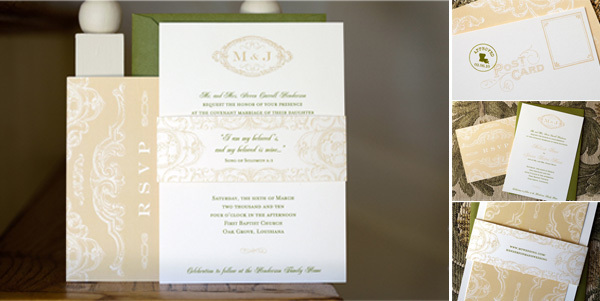 For more information on these beautiful wedding invitations, make sure to stop by Paper Moss.